From a visit to the Midwest to dining on the Eastern Shore, this was a painting that I knew I had to paint! I was out in the fields east of Tulsa, Oklahoma, last March with a friend of mine who lives there. We were on the hunt for oil pumps because I have wanted to create a painting with an oil pump for awhile now. After we found several pumps, my friend explained how the oil is pumped out of the ground to collection drums. We followed the above ground lines from the oil pump to the collecting drum, which is when we found this old rusty drum with peeling paint. I knew I had to paint this as soon as I saw the hand hold in the picture frame — the pitted texture of the rust, the flaky texture of the peeling paint with the rigid structure of the rebar all nicely balanced with the delicate shadow. All it needed was a subject. I played with several different ideas for birds to complete the composition but it wasn't until I was discussing Scissor-tailed Flycatchers, the state bird of Oklahoma, with friends and fellow artists Paul Rhymer, Jan Martin McGuire and James Hines over dinner on the Eastern Shore that it hit me. 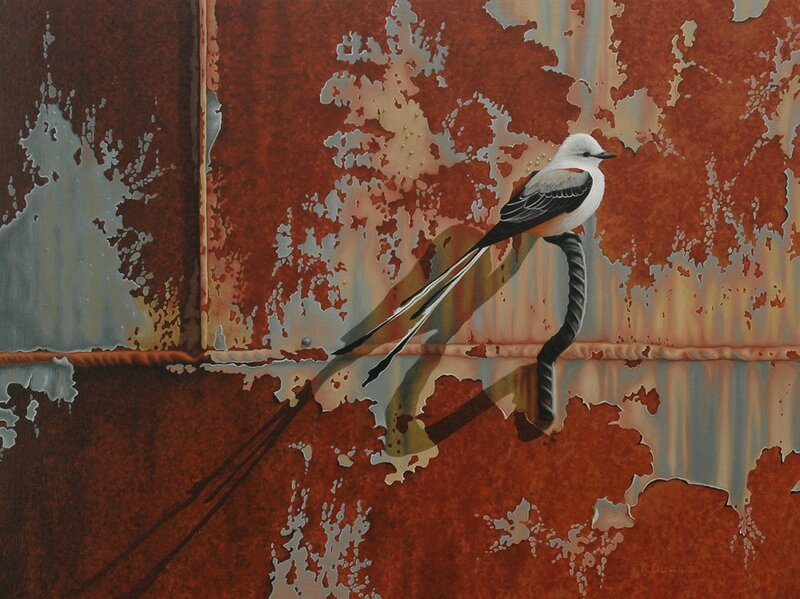 The composition now had a subject, a Scissor-tailed Flycatcher. A visit to Oklahoma, a scene from Oklahoma, the state bird of Oklahoma and a painting that I was extremely excited to paint … yet it was a trip to the Eastern Shore of Maryland that brought it all together.